Understanding all the underlying protocols that are used in RDP was one of the hardest parts of writing this library. For some of them, it was a challenge just to find out their purpose. The connection sequence alone makes use of four protocols: TPKT, X224, MCS (T.125) and GCC (T.124). Moreover, sometimes the connection uses TLS and sometimes it uses RC4. This means we need to be able to start TLS after the first few packets of the connection if necessary. Also, sometimes the client may want to use CredSSP for authentication, sometimes not, so we need to watch out for that. Also, once the connection is established, you can switch to a fast-path alternative which doesn’t even use any of the aforementioned protocols. Furthermore, sometimes graphics are sent as bitmap images, sometimes they go through a Dynamic Virtual Channel and sometimes they arrive as GDI drawing orders. Confused? So were we. That’s why we made this simple diagram explaining the connection sequence. [Ed note: this is a so-called deep-fried meme meant to represent irony]. RDP is a very feature-rich protocol. It supports basic user interaction such as mouse and keyboard events and graphical updates. It also has advanced features such as sound playback, clipboard sharing and device redirection (for things like printers and drives). In other words, we had a lot to work with when building PyRDP's MITM. Unfortunately, we couldn’t implement everything in RDP during our internship – it would have taken way too long. We mostly focused on implementing the features that were important for our honeypot. However, we tried to make the core implementation versatile to make it easier to add new features and program other tools. One of the features we wanted was the ability to change the username and password entered by the user. We use this to make any connection to the MITM tool successful, regardless of the username and password used. This allows us to see what malicious users do when they get an actual RDP session, not just a login screen. Among the advanced features of RDP that we implemented are virtual channels. These are RDP “plugins” that have various uses: clipboard sharing, drive mapping, sound playback, etc. When a client connects to the drive redirection channel and sends a file, our MITM saves it to disk. This can be useful to malware analysts, since they can retrieve the files later for analysis. When the client connects to the clipboard channel and copies text to their clipboard on their host machine, the MITM logs the copied data – even if it the client doesn't paste it. This works even if the RDP window is out of focus. Other virtual channels should work seamlessly for the client. However, the MITM doesn't do any special processing: it simply forwards data to the real server without parsing or modifying it at all. One feature of RDPY that we really liked was the ability to replay an RDP session and see what happened. We decided to take this concept even further by making our RDP player able to receive data from live RDP connections. This way, you can watch RDP sessions as they happen! 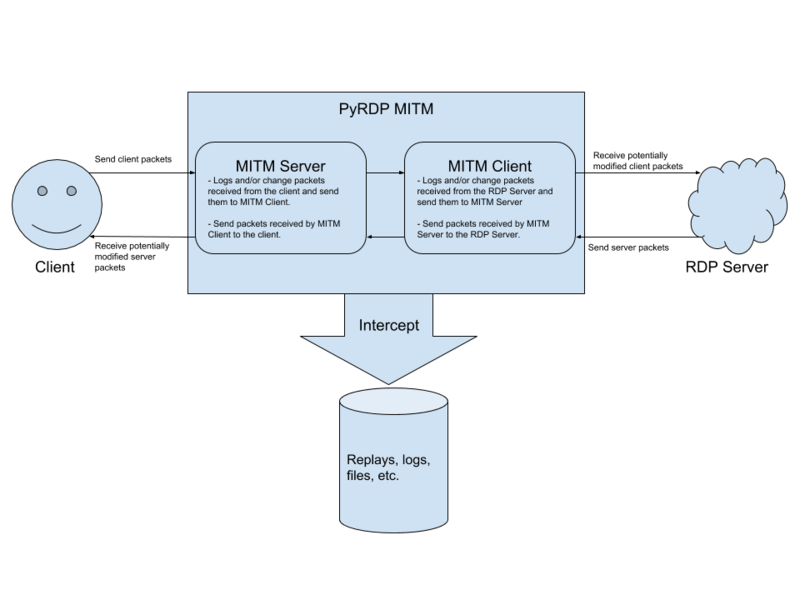 Once we had an initial working version of PyRDP, we put it on the Internet. We exposed the RDP port of a dummy Windows virtual machine (VM) through our MITM to see how it would behave against data in the wild. One of the first things we noticed was that we were getting a lot of connections from strange clients. These clients would wait a bit, run the sticky keys executable by pressing shift 5 times, and then disconnect. These scanners were expecting a command prompt to pop up instead of the usual sticky keys window. This classic backdoor is usually implemented by replacing the sticky keys executable (C:\Windows\System32\sethc.exe) with cmd.exe. We found out that these connections were most likely generated by this tool available on GitHub. Since we wanted these scanners to infect us, we deployed the backdoor on our VM as bait. Several days later, we realized that none of the accounts on our VM were accessible: we had been infected! However, we could not find any saved replay files of this infection. We found out that a bug in an earlier version of PyRDP prevented the replays from being saved. Still, we wanted to know what happened and when. Thus began the investigation of this malicious user – whom we nicknamed Debbie. Bingo! We had two clear conversations that were standing out. Fortunately for us, Debbie connected using TLS. 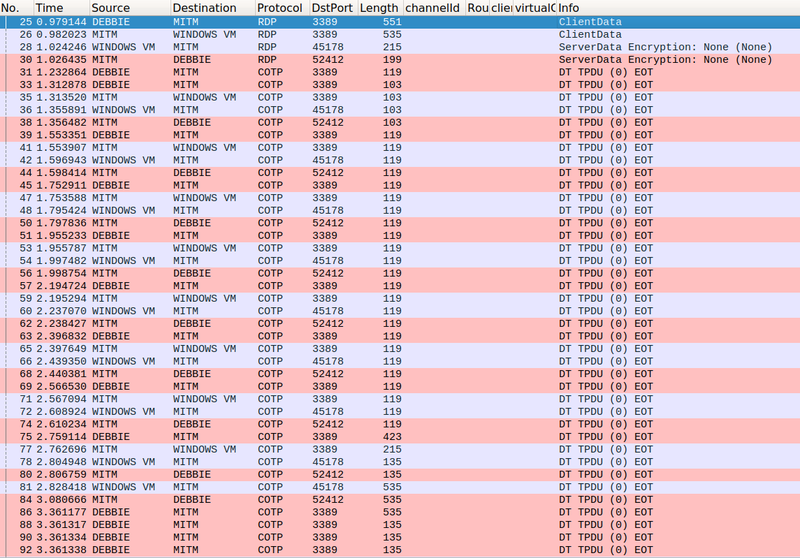 Since the MITM logs the TLS master secrets, we were able to use Wireshark to decrypt the conversations. A quick analysis of the traffic showed that Debbie used the drive redirection channel to transfer files to our VM and infect it. We also found that Debbie used RDesktop, since it has a lot of hardcoded constants that make it easy to fingerprint. We had our mind set on having replays of the incident. Even though our earlier version of PyRDP did not save the replay file, we still had all the data necessary to rebuild it. We decided to write a script to create replays from the packet captures we had. This was also a good opportunity to test the usability of our project as more of an RDP library. 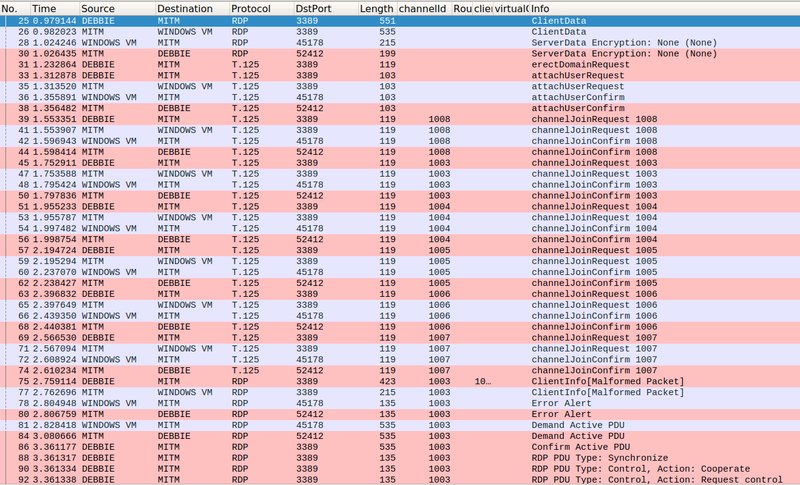 We used Wireshark’s “Export PDUs to file” feature to generate a pcap file with only the decrypted traffic. As you can see, using scapy and PyRDP, it takes a bit more than 100 lines of code to create a replay from a pcap file, which is decent considering the complexity of the RDP protocol. This is what we used to build the replay that you saw earlier. As you can see, this script copies 4 other files to the system. After a brief analysis, we found that one of these files was an instance of LimeRAT, an open source Remote Access Trojan with a Monero miner module. LimeRAT uses Pastebin files in its configuration to fetch its Command and Control (C2) server. However, by the time we found the Pastebin URL for this instance, it was too late: the user had already made the file private. At the time of this writing, the files on Bitbucket had over 30 000 downloads. When exposing our MITM on the internet, we got fewer complete connections than we anticipated. Minimal scans that only send one or two packets are frequent (hundreds per day). Scans that complete the whole connection sequence occur dozens of times per day. Actual connections with meaningful actions from the client are rare. Another thing we noticed is how hard it is to maximize compatibility with various RDP clients and scanners. Every client and server has its differences, despite the well-written RDP specification. For example, the RDP specification requires that the client sends an ErectDomainRequest at the beginning of the connection sequence. However, since this packet has virtually no effect, the Windows RDP implementation does not actually require it. Small implementation quirks like this make it hard to support every client and scanner that exists. In the spirit of Christmas, we decided to release our project right away on Github, licensed under the GPLv3. For now, we want to see what kind of malware we can catch and battle-test our MITM in pentest engagements. We also have more feature ideas to extend the MITM, such as an active drive enumerator to list the contents of the drives mapped by the client. This blog post was written by Émilio Gonzalez and Francis Labelle as part of an internship with us. When they started they didn't know each other and are from different universities. Yet they decided to tackle the hardest project on our list together. We are incredibly proud of what they accomplished and we think PyRDP is a promising project that will enable us to study and understand bad actors better. 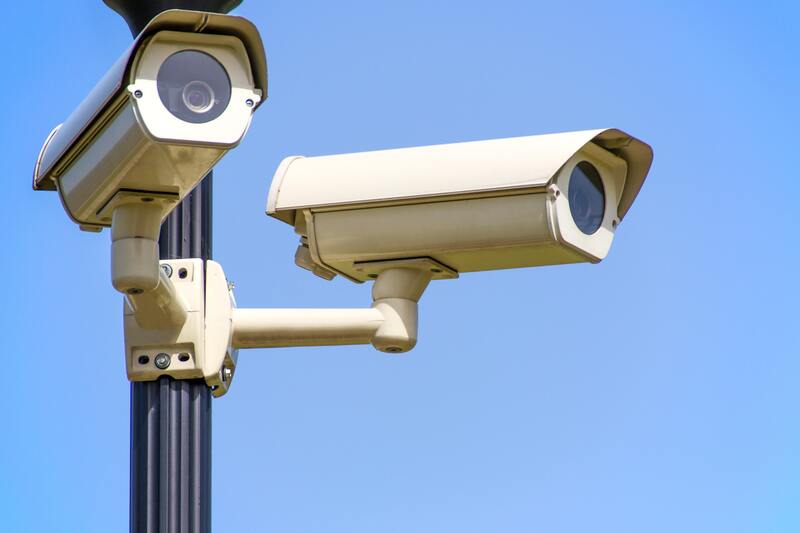 Also, it will serve to educate systems administrators about the risk of clicking through RDP warnings and the importance of deploying a proper PKI for their remote support needs. We wish them good luck with their next endeavors.